World MS Day is May 25th! How MS has affected my life.. I was diagnosed with it 10 years ago (though I may have had it for 20 or more years). I'm one of the 10% of MS people who have Primary Progressive MS. No major attacks, just a steady decline. In my case it's very slow. Yesterday we went to see Susan Hillier (Uni SA Associate Professor in Neuroscience & Rehabilitation), who confirmed how slow the condition is with me. 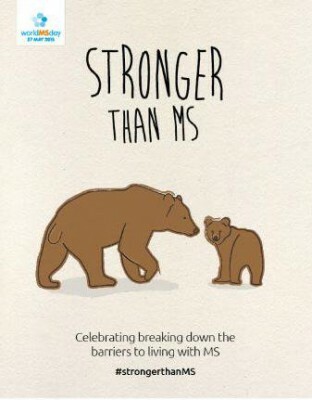 MS literally means ‘lots of scars’. Lots of symptoms too, but it may be hard to identify them. Especially as they may simply mean you’re getting older. The most obvious one for me is balance. I was a good sportsman when I was younger, in both football & athletics. Excellent balance. Not any more. Overheating hasn’t been bad for me but it is for many & is creeping up on me too. Fatigue happens after just a little physical exercise, & combined with this eyesight is affected – focussing becomes harder. There may be other symptoms too, but these are the obvious ones in my case. As Susan said, it’s slow with me, & I’m very fortunate. I think I'm both very lucky & well prayed for! I posted an abbreviated form of this post on Facebook & received numerous messages & ‘likes’. As with so many health conditions, research continues. New treatments are found, but exactly why & how it happens is still a mystery. Sanket, 38-year-old Indian mechanical engineer from Indore, who has MS is quoted as saying, "Don't make too much out of MS, Just carry on". Mmm - maybe easier for some than others, but it's an attitude that is almost required. MS is here to stay! So, on this day especially, spare an extra thought & a helping hand for people with MS.
For more information on MS and to read 27 important facts about multiple sclerosis, click here!